How to enable CSF from a command line using Linux? CSF is the most popular application level firewall used by VPS hosting providers. You can use the switch ‘e‘ on with the command CSF to enable ConfigServer Security & Firewall on the command line. Enable csf firewall: (Enable CSF firewall using the following command). The same command can be applied on Linux VPS hosting or Cloud or dedicated of any linux flavours such as Centos, RedHat, Ubuntu. How to disable CSF from the command line using Linux in Dedicated solution? Use the switch ‘x‘ to disable CSF. To restart the CSF, you can use the ‘r’ switch. 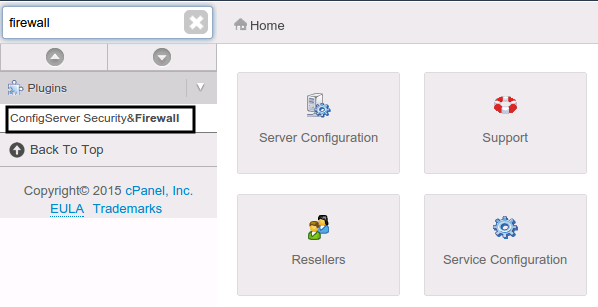 Type firewall in Find bar and click on ConfigServer Security & Firewall link. If you are shared hosting customer with us, Then you do not have the option to handle or start and stop the CSF firewall, This will specific only for Linux Dedicated Server users. Today Linux is one of the most used operating systems in the world the reason behind it is that it is very easy to manage, handle and also flexible. And today if you are looking to buy a Linux hosting for your website, then think of us. We are #1 Customers choice in India in terms of Linux hosting. Here at HostingRaja, we provide Linux hosting at an affordable price and along with amazing features. Choose our Linux hosting today and get discount upto 55%. Get your Linux plans from India's #1 Hosting provider.